On September 27, 2018 the world watched as United States Circuit Judge Brett Kavanaugh defended himself against sexual misconduct allegations, from thirty-six years prior, during his own confirmation hearing to the Supreme Court. The hearing, turned trial showed two testimonies. The first was from the plaintiff, Dr. Christine Blasey Ford, who gave a solemn, dignified, and straightforward account of her experiences. In sharp contrast to this was Kavanaugh’s unhinged defense, which made me wonder; if this guy is this unprofessional during a job interview, what’s he like when he’s actually working? 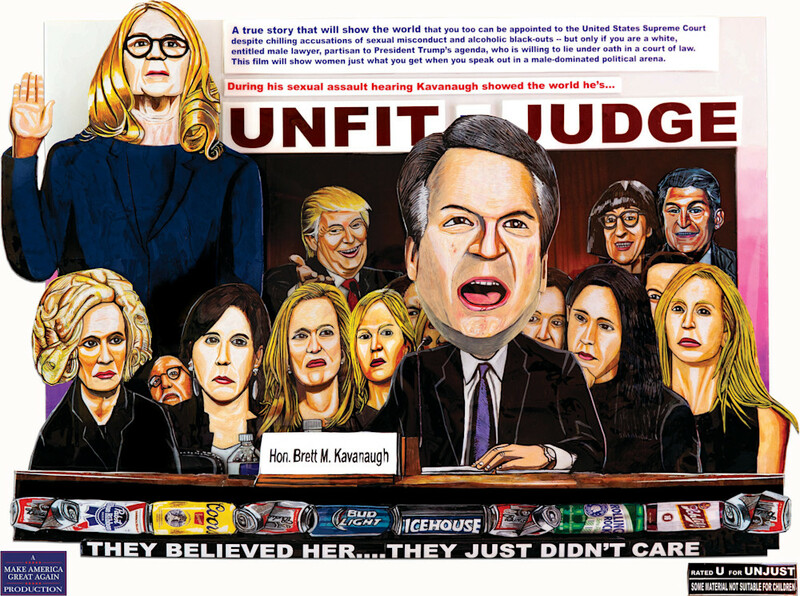 I made this artwork Unfit To Judge because I feel Kavanaugh is unworthy of being appointed to the Supreme Court for three reasons: his partisan views, his conduct during his testimony, and the possibility that yet another person accused of sexual misconduct is able to rise to the highest reaches of power and in this case, remain there for the duration of his life span. In making this artwork I sought to visually show the contrast between the brave and dignified Dr. Christine Blasey Ford—shown with her hand up, swearing to uphold the truth in a court of law with the indignant and childish spectacle of Brett Kavanaugh—shown with an over-sized bobble head and a tiny body. The size of his head is a visual metaphor for his own inflated sense of self worth and entitlement, which was clearly communicated by him during his testimony. He is seated with his wife, daughters, and spectators whose faces reveal their true emotions regarding this matter. In addition, Donald Trump, and Senators Susan Collins and Joe Manchin are also included in my gallery of the damned—Donald Trump, not only for appointing Kavanaugh, but for further denigrating Dr. Ford by laughing at her expense and discrediting her story—Susan Collins for being a female who voted for him and for being a sell-out to women and genera—and Joe Manchin, whose tie-breaker vote got Kavanaugh his appointment.